Gain a competitive edge by providing each customer with a tailored experience. Delay-free preview dialing increases actual contact with outbound leads, keeping your agents motivated and fully equipped to provide stellar customer experiences. A preview dialer offers increased agent talk times over a predictive dialer, eliminates call abandonment, and gives each agent the opportunity to tailor and enhance each customer experience. Agents can access customer information like call history, customer preferences, and additional notes, and use that information to personalize each outbound call. Once agents finish their research, they can press a button and the Connect First system will dial the lead for them, ensuring the person dialed is always connected to a live human once they pick up the phone. Increased Growth With Engaged Customers. 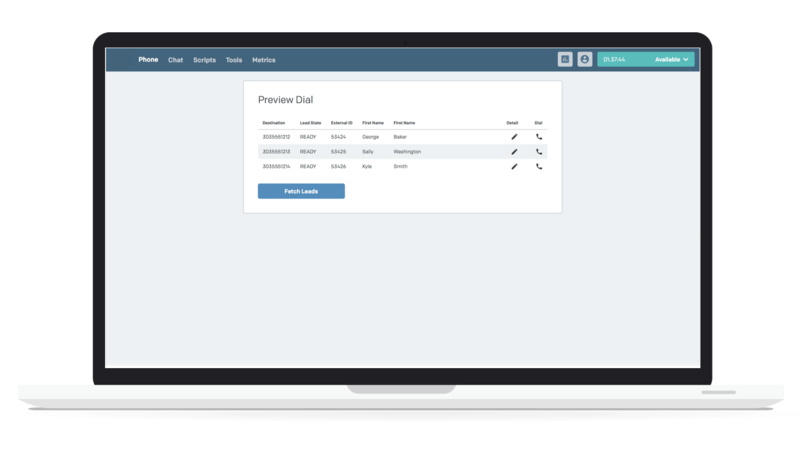 The Route2Cloud preview dialer allows you to provide better experiences for your contact center’s customers. See who you’re about to call beforehand. Take time to learn about each customer. Look up additional information as needed. Then let the system do the dialing for you when you’re ready, eliminating incorrectly dialed numbers, saving time, and minimizing human error. The Route2Cloud preview dialer is perfect for those special campaigns that require extra agent care, or if you simply believe every customer should always receive a highly personalized experience. Over three quarters of consumers will choose to do business with a company that personalizes their experience over one who does not. Improve the quality of your customer interactions by providing tailored interactions — and watch your sales increase. Deeper Personalization via Seamless Integrations. You keep different data on your customers in disparate systems, and you want the ability to access it all within one unified agent desktop. Route2Cloud dialers allow you to seamlessly link to all your systems, all in the same browser. We offer CTI technology (computer telephony integration) that links to external resources and displays information via call pops (or screenpop) during calls, and a completely open API that allows you to integrate your existing systems and pass data securely to internal and external resources and applications. Access all your resources in real time and use the insights gained to provide better service and continue surprising and delighting your customers. It’s no secret that engaged agents are happier and more productive. Happier employees equal less turnover for your business, and increased savings in hiring, training, and incentive costs. The Route2Cloud preview dialer takes pressure off of your agents by eliminating discouraging call abandons and giving agents the power to initiate dialing at their discretion. And agents are better prepared to delight customers with more personalized information, eliminating difficult interactions with consumers who feel frustrated by generic service. Our suite of advanced reporting tools is available for both deep analysis and on-the-fly decision-making. Real-time dashboards are highly configurable and allow you to display any metrics, statistics, data, and integrations you need for on-the-spot insights, while our historical Reporting Studio allows you to track progress over time and analyze trends to further optimize and increase efficiency in your call center. Route2Cloud’s unified agent desktop was designed to be intuitive and easy to use. Admins can configure the agent interface to display everything agents need to see and nothing they don’t. Agents require less training and monitoring, and can maximize their time with access to all the resources they need on one screen. No more laborious navigation between multiple open screens to gather and save information while the customer waits impatiently for minutes at a time. Route2Cloud Dialer Systems. Built For Better Service. Every Route2Cloud product is built to enhance customer experiences. Not just your experience, but your customers’ experiences as well. Our robust suite of call center software solutions was designed to serve and support you with the challenges you face in the contact center industry, both today and tomorrow. Our scalable solutions are reliable, affordable, and built with usability and convenience in mind to make growing your business and providing excellent care an achievable combination. Let our full suite of outbound dialers give your business the competitive edge it needs to rise above your competitors.